The discovery by NASA's LCROSS mission of an estimated billion gallons of water ice on the moon is an incredible boon for exploration, research and industry. From ice of course comes drinking water, oxygen for breathing, hydrogen and oxygen for rocket fuel; as well as resources for industry. Ice on the moon greatly lowers the cost of operating moon bases as such supplies will not have to be hauled at great expense, and it allows rockets to be refueled on the moon--rockets will not need to carry fuel for the return trip. This makes establishing long term inhabited bases on the moon safer and less dependent on an expensive supply route. With the discovery of such quantities of ice, the parallels with Mars become even greater. We have essentially every resource and challenge on the moon needed to successfully learn how to live on Mars. Both have ice, abrasive dust, high radiation levels, extremes of temperature, low gravity, and much more. This base, just three days to home in the event of an emergency, is where we will perfect the equipment for Mars and train the astronauts for Mars. Other finds by LCROSS on the moon include hydrogen, ammonia, methane, mercury, sodium and silver; useful for industry and long term habitation. Lunar "regolith" (dust/soil) contains a great deal of oxygen, silicon, and aluminum, providing yet additional essential resources. Congress and the Administration should now set as America's top space priority establishing a research base on the moon. 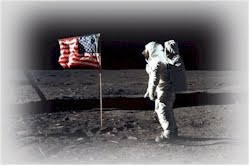 Please contact your Senators and Representative at 202-224-3121, http://www.house.gov/ and http://www.senate.gov/ plus all candidates (via links to their websites at http://politics1.com/states.htm) with the message that America must now return to the Moon.